I’ve been on the hunt for some well-fitted, flattering white denim for some time now. However, as fellow pear-shaped ladies will know, this can be quite the daunting task. Last week, I strolled around the mall to explore my options and was thrilled to find a non-jean alternative that exceeded my expectations: not only do these stretch cotton pants look more flattering than anything else I tried on, but they are about ten times more comfortable too! Of course, I didn’t realize until after the fact that taking photos of white pants on a light coloured concrete sidewalk is not the best idea – better pictures next time! Oh my! Those pants really ARE flattering! I love your blouse and your bag, too! 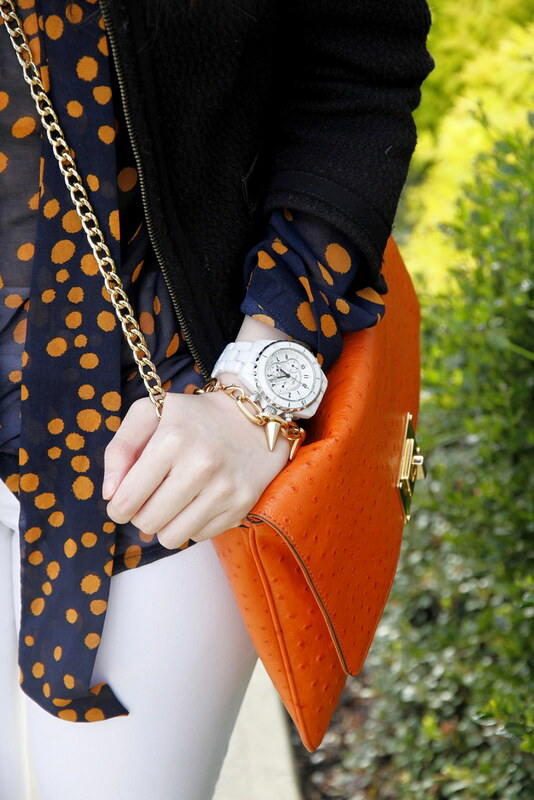 I love pairing orange with white. So fresh and clean. Love the bag (and your new white pants)! Jen, I am dying over your shoes! I have had my eye on those for ages, they are so, so cute! I’ve been swooning over the reddish ones! Love the white watch, too, so great for summer! xo! nice pants.very elegant in white.i simply adore your shirt and bag! Especially love that bright orange purse! Very cute outfit. I am on the hunt for some colored denim but haven’t found one which fits nicely. Will try Aritizia when I am hitting the mall later. You look lovely. Great find with the pants! I love your wedges. I love the entire look. Those pants make your look so fresh and I love your shoes – so perfect! Those pants look great on you! I love the blouse and the wedges too. The photos still look great, the white pants look crisp and clean against the cement background. You always look so effortlessly chic my dear 🙂 Love those pants! Did they have them in any other colours? Love this outfit! Where is the watch from? I went into Aritzia for the first time at the Short Hills mall in NJ. It’s a very nice store. I love the purse. It a fun colour for this year.